Ellie Austin discusses her experience of editing the 27th edition of Journalism alumni magazine, XCity. Work on XCity began in January. Our initial focus was on securing a big name for the cover. In our first ever editorial meeting we drew up a list of potential targets - Anna Wintour, Andrew Marr, Alan Rusbridger, Caitlin Moran...It's probably fair to say that we were aiming high. Multiple rejections later, our optimism was beginning to waver. We added more names to our hit list and continued writing letters and hassling PRs. Finally, our persistence paid off. Mr. Media Mogul himself, Piers Morgan, agreed to a 15 minute Skype interview from LA where he was preparing for awards season. Thrilled, we started drafting questions. 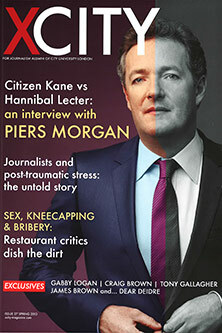 A couple of days later, we received a brusque e-mail from Morgan's PR: Piers was busy and the interview was cancelled. However, having worked so hard to snare our cover star, we were not about to give him up without a fight. Making full use of the power and accessibility of social media, all 18 members of the XCity editorial team tweeted Morgan the same message at the same time, begging him to reconsider. His response came four minutes later: "OK, OK, I get the message from you and all of the other students! You can have a 15 minute interview." Luckily, or rather, thanks to the skill of our two XCity boys tasked with interviewing the CNN presenter, 15 minutes became 32, providing us with enough Morgan controversy for a five page spread in the magazine. Our pursuit of Piers was only one aspect of making XCity. Every member of the team also contributed news stories and pitched features. The result is a magazine full of exciting, original content that ranges from a hard-hitting investigation into women and social media abuse, to an interview with restaurant critic Giles Coren where he admits exchanging sexual favours for good reviews. The climax of the project was production fortnight, when our normal lecture timetable was suspended to allow us to spend all day, everyday designing the magazine. The days were long, (we worked from 9am until at least 10pm, sometimes midnight), and progress was often slow as computers crashed and we agonised over the front cover design or a difficult headline. However, for those two weeks we were a real editorial team, working to daily deadlines. It was exciting and exhausting and an enormous learning curve. Last week, XCity 2013 returned from the printers. It has since been sent to all City journalism alumni as well as editors across the industry. Yesterday the Giles Coren story was picked up by the Guardian. It was only a few months ago that we started at City. Most of us had applied for the course because, (and yes it's a massive cliché), we loved the escapism of flicking through our favourite magazine. We had written for student newspapers and done work experience, but we had no idea of the reality of producing a magazine.That is no longer the case. We now have invaluable experience in every aspect of magazine production. We also have a very professional magazine - with Piers Morgan's face on the front - that I know we'll all be proud of for years to come.